Figure 1: The comparison of the current cycle (Solar Cycle SC) 24 with the similar SC1 and the mean SC1 ... SC23. Figure 2: The summed differences from the mean (blue in Figure 1) of each cycle. 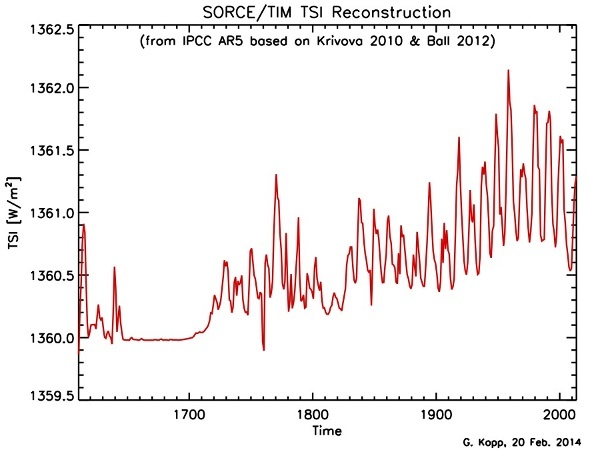 Figure 3: The change of TSI in the last 400 years. Source: University of Colorado. we detect changes of 1 ... 2W / m² in almost every cycle. Why does not the temperature lift more, while other so-called forcing components (eg volcanoes) leave much clearer traces of this magnitude? A hypothesis presented Dr. David Evans of Australia in recent weeks. In short his explanation: there is a filter in the system Earth-Sun, which suppresses the eleven-year fluctuations in the signal processing is referred to as the "Notch Filter". It should work quite well at 11 years, longer-term changes he can by. If you are interested, the contributions and the very lively discussion to read here from Part 1 . Evans predicts an imminent slowdown, so the hypothesis is quite good falsifiable. In the current football fever could also be formulated with Franz Beckenbauer: "Schau'mer ma '!" "The air above land heats up generally stronger than over water ... Because of the area fraction of the oceans of 71% is the heating of the land on average more than twice as big as the sea." 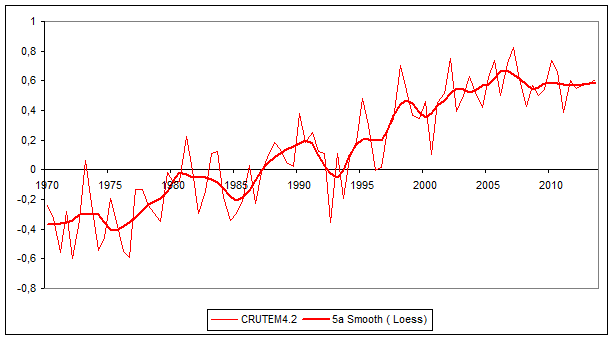 Figure 5: The trend slopes (red) of the series of figures 5 to 2013, and their error bars (black). We see that the trend to 2013 with the start of 2000 compared to the is only half as steep at the start of 1993, although the concentration of greenhouse gases continue to increase monotonically. Is the slowdown in growth after 1993, however, significant, or is it still within the 95% confidence level, and it could also be a coincidence? One often hears that shorter trends are not meaningful and only long rows of 30 years are meaningful in climate science. This is so not right! In principle one can use any long or short trends when one considers the uncertainty of the statements and is clean. Man looks at the error bars in Figure 6, as the sizes are increasingly 'blurred', the shorter the examined rows are. 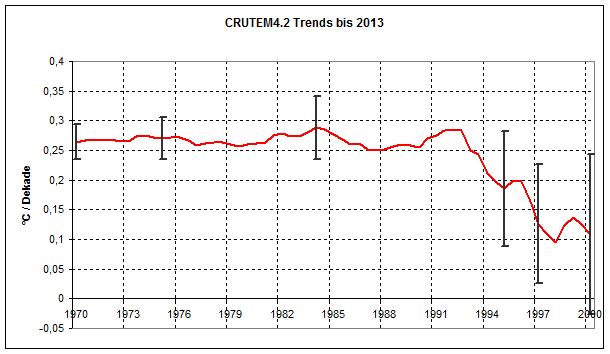 The trend 2000 (inclusive) -2013 is only 14 years (and the range of uncertainty so great that he is no longer significantly increasing), which from 1984 to 2013, however, 30 However, one can conclude: The trend from 1984 to 2013 is significantly higher than that of the developing "Super Elnino" In 1998, still played from 1997 to 2013, mind you from the first half of the year at the beginning of the year, by no role in the country temperatures. The lower error bar of the trend from 1984 to 2013 (and many years before that) do not overlap with the upper error bars from 1997 to 2013, first semester. The "pause" in the country temperatures should indeed respond significantly more to the warming caused by greenhouse gases by Wikipedia as the surface temperatures of the oceans, is no accident, but rather significant. The apparent resonant internal variability of our climate is also reflected here, thus reducing the potential effectiveness of greenhouse gas to the temperatures overall. Figure 6: The current anomaly of the heat content of the tropical Pacific (top) compared to the same month in 1997 Source:. NOAA . The atmosphere has not responded to this date further dwindling warm anomaly of the ocean (only as a shadow of itself compared to April) as before. A strong El Nino is almost impossible, it might also be good to be expected with neutral conditions at the end of the year to go. The predicted more Super El Nino after 1998 will not come.